Feminist Women’s Health Center has been providing safe and compassionate abortion and sexual health services since 1976. Learn more about how it all started below! In 1976, as part of a Federation of Feminist Women’s Health Centers, the Atlanta Feminist Women’s Health Center was founded with the mission of providing safe, supportive and non-judgmental abortion and gynecological care services, consciousness raising meetings, and self-help workshops. Over the years, influenced by the work of reproductive justice leaders like Loretta Ross and SisterSong Reproductive Justice Collective, we recognized the need to adopt an intersectional approach and move away from a pro-choice centered framework. 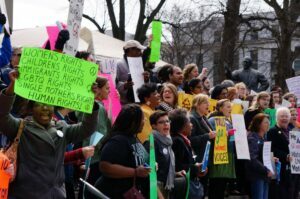 Integrating a reproductive justice framework is ongoing work that has informed and shaped us as an organization, and led to development of programs and services that specifically seek to address systemic inequities in healthcare and society that affect women, people of color, immigrant families, low-income and rural communities, and people from the trans and LGBQIA+ communities. You can learn more about our history through the in-depth timeline below.